Other Details: Mondays to Wednesdays, Fridays. Other Details: Mondays to Fridays. Operating between Fakenham, Oak Street and Kings Lynn, Bus Station given service number X8 effective from 18-Mar-2013. To amend Timetable. Operating between CROMER and NORWICH given service number 5A effective from 18-Mar-2013. To amend Route and Timetable. Operating between Cromer Cadogan Road and North Walsham - Post Office given service number 5 effective from 18-Mar-2013. To amend Timetable. Operating between Holt, Edinburgh Road and Cromer, Cadogan Road given service number 4 effective from 18-Mar-2013. To amend Timetable. Operating between Reepham and Norwich, Norwich High School given service number 44/44A/X44 effective from 18-Mar-2013. To amend Timetable. Operating between NORTH WALSHAM and CROMER given service number 33/33A effective from 18-Mar-2013. To amend Route and Timetable. Operating between NORWICH and HOLT given service number 45 effective from 18-Mar-2013. To amend Timetable. Operating between HOLT and FAKENHAM given service number 46 effective from 18-Mar-2013. To amend Route and Timetable. 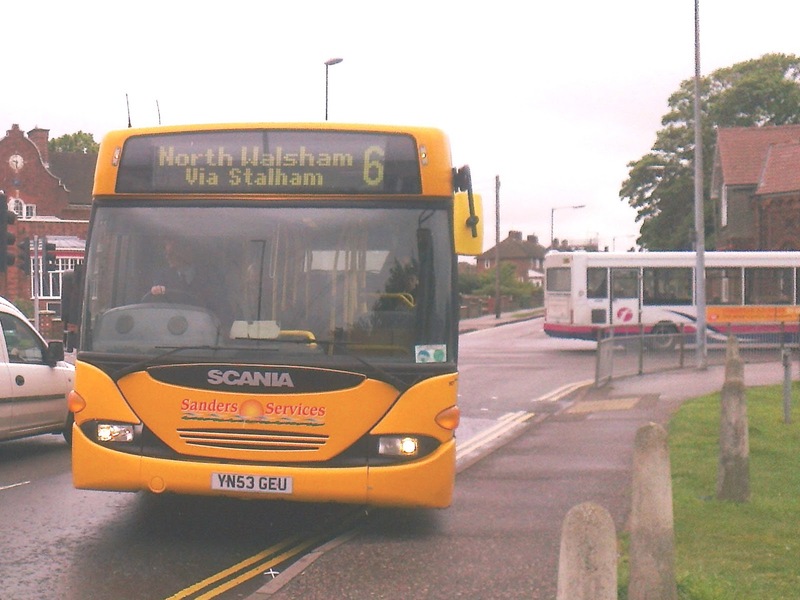 Operating between North Walsham - Post Office and Norwich City Centre given service number 55 effective from 18-Mar-2013. To amend Timetable. Operating between N. Walsham (Park Lane) and Reepham High School given service number 615 effective from 18-Mar-2013. To amend Route and Timetable. Operating between Holt, Market Place and Fakenham, Oak Street given service number 9 effective from 18-Mar-2013. To amend Timetable. Operating between Southwold and Southwold, given route number Southwold Shuttle starting on 29/03/2013. Operating between Bungay and Lowestoft given service number 601/601A effective from 02-Apr-2013. To amend Timetable. Operating between Lowestoft and Norwich given service number 146 effective from 02-Apr-2013. To amend Timetable. Operating between Halesworth and Lowestoft given service number 602 effective from 02-Apr-2013. He also states that First Essex ALX 400 30900 W774DWX migrated from First Essex back to First Eastern Counties arriving at the Great Yarmouth depot yesterday. After completion of MOT/inspection work she will be used at nearby Lowestoft. Sister 30901 W756DWX is also expected today. Whilst most photographers would pack up their bags and head for home, Richard Alger took this atmospheric picture of a First Eastern Counties Wright Eclipse Gemini. Firstgroup has recently announced that its bus division has ordered 464 new vehicles worth £76m for delivery in the 2013/14 financial year. This order will bring First’s investment in new buses to around £240m in three years. Meanwhile X1 services have resumed their usual route in Gorleston following the early completion of road resurfacing work at the Church Lane, Crab Lane, Magdalen Way and Shrublands Way junction. The resurfacing work means that access to and from Magdalen Way and Shrublands Way has been closed to traffic. As you are all no doubt aware, four more of the new biogas buses joined the Anglian fleet at the beginning of the year and were introduced into service in late January. between Halesworth and Norwich, via Bungay, from Wednesday 23rd January. All four were initially launched with the standard Anglian Bus livery due to operational requirements. New designs for these vehicles were being worked on following delivery. Today's Route One publication has a number of local vehicles for sale in its classified section. Both vehicles were acquired from Amza of Blofield following its demise in December 2009. Among other vehicles available are two former 03 Anglian Scanias (with dealers Southdown PSV) and some coaches from the North Walsham based Marrett's Chariots fleet. With road resurfacing work due, the junction of Church Lane, Crab Lane, Magdalen Way and Shrublands Way in Gorleston will be closed to all traffic to and from Magdalen Way and Shrublands Way from Monday 18th to Wednesday 20th February 2013. Traffic from Church Lane and Crab Lane will be able to continue in an Easterly or Westerly direction only. Service 2 towards the James Paget Hospital ~ Normal route to Church Lane then via Crab Lane, Forsythia Road, and Almond Road resuming normal route turning left into Oak Road. Service 2 towards Great Yarmouth ~ Normal route to Oak Road then via Almond Road, Forsythia Road and Crab Lane resuming normal route crossing over the junction onto Church Lane. Services X1 & 8 towards the James Paget Hospital ~ Normal route to Church Lane then via Crab Lane, the A143 Beccles Road and Long Road/Trinity Avenue resuming normal route turning right onto Magdalen Way. Services X1 & 8 towards Great Yarmouth ~ via the outward route above but in reverse. Norwich's bus station at Surrey Street is to close for eight days later this month for repairs to the roof. X1 towards Dereham, Kings Lynn and Peterborough will depart from outside John Lewis on All Saints Green. X1 towards Great Yarmouth and Lowestoft will depart from Surrey Street outside Norfolk Tower near the Surrey Tavern. X2 towards Loddon, Beccles and Lowestoft will depart from Surrey Street outside Norfolk Tower near the Surrey Tavern. Yesterday was the last day of Anglian operating its 603 route between Carlton Colville and Lowestoft Bus Station. As it was the final day of Anglian running the 603 to Carlton Colville, thoughtfully cancelled by them within weeks of having the route to themselves, I ventured out to get a couple of photos. It was a bit gloomy and overcast but I did see both the regular Solos running plus the dinner time meal relief, which was Trident X251NNO on the 13:12 departure. My thanks to Syd for the report and photographs. The first vehicle photographed was one of Anglian's MAN EcoCity gas buses in St Stephen's Street. 608 AU62DWL was working the 588 service to Halesworth. MAN EcoCity buses were observed - 603 WX62HHF arriving in Surrey Street Bus Station on a 146 service from Lowestoft and 610 AU62DWC departing St Stephens Street with a 588 to Bungay. The final photo shows Konectbus ADL Enviro 400 606 SN61CZW leaving a busy bus station with the Dereham Fast 8 service. Volvo B10BLE 60807 S658RNA is to receive a new engine before it returns to service. Des Speed was on an X1 service from Great Yarmouth which was waiting at the traffic lights to enter Norwich Bus Station yesterday. Imagine his surprise when a Sanders Scania Omnicity YS03ZKV turned into the bus station from the opposite direction, with the rear engine cover open! After dropping off passengers the bus proceeded to the layover bays. Des didn't know if the bus continued further with the engine cover up, as he had to catch a connecting service. Surprise news from Grahame Bessey is that Sanders has acquired three similar vehicles from Anglian Bus. A friend of his was visiting the bodyshop at Full Circle on Friday when he observed three Scanias with YN03UV* registrations awaiting their painting into Sanders livery. My thanks to Des for the photo and information and to Grahame for his exclusive news! out of service since Thursday night (31st) awaiting replacement of glass in its emergency door. Volvo B10BLE 60807 S658RNA has returned to Caister Road but it looks as though further repairs are needed before she can return to service. Four vehicles were parked up at the site on 5th May 2004 when the fire occurred. The vehicles involved were Darts M230VWW, J514FPS , Coach N613APU and Scania R144GSF which was only slightly damaged. Only the last mentioned escaped intact with the remainder written off.